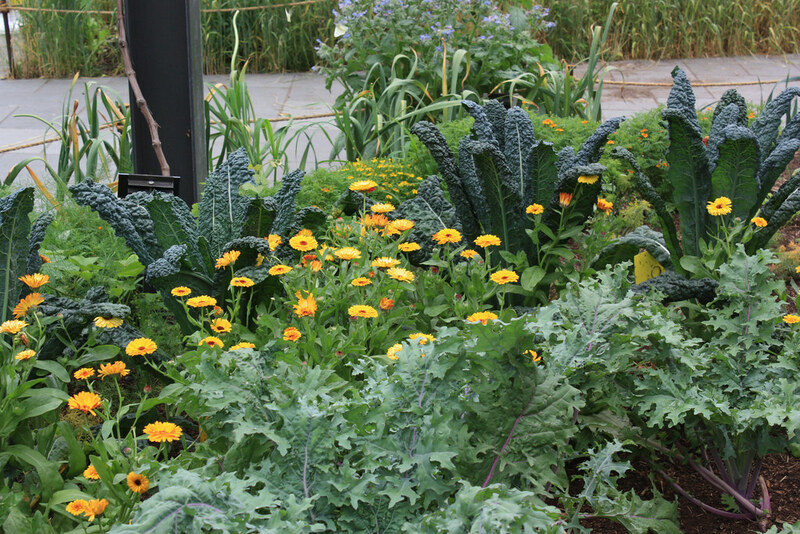 Kale is one of those plants that sits precariously upon the horticultural/gastronomic fence. On one side are the people for whom kale is that dreadful, oh-so-good-for-you green their mothers dutifully pressed upon them, or at best that workhorse of the ornamental autumn garden, along with potted mums, pumpkins, and Indian corn. On the other side are the folks who prize kale's nutrient-packed leaves and appreciate the new dimensions its variable foliage forms and colors add to both the flower border and the edible landscape—not to mention the fact that it is one of the few green vegetables that can be harvested throughout the harshest winter. The reality is that this astonishingly diverse and delicious vegetable offers something for everyone. 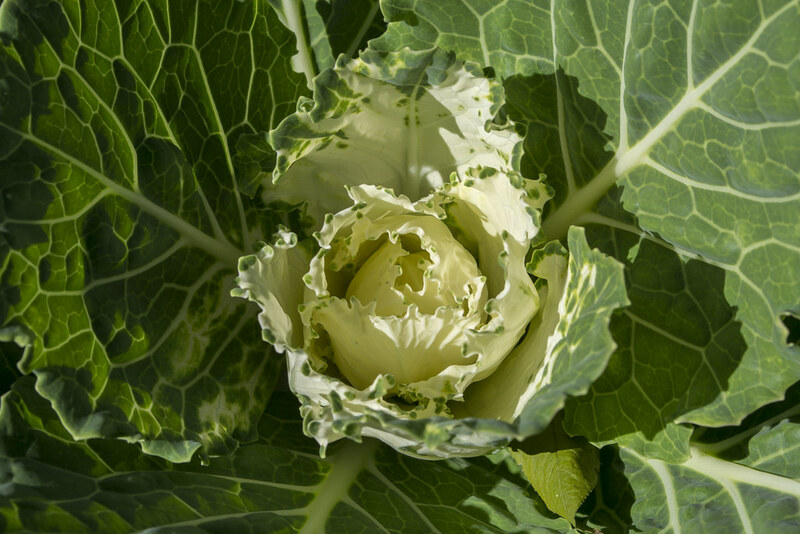 Kale belongs to the cabbage family, or Brassicaceae, along with collards, cabbage, cauliflower, brussels sprouts, and kohlrabi, to name just a few of its comestible cousins. It was one of the earliest vegetables to be cultivated by humankind, and the classification of the resulting multi-millennial cornucopia of forms, varieties, and cultivars remains confusing and debatable. There appear to be a few distinct strains of kale. Brassica oleracea var. acephala (syn. Brassica oleracea var. capitata), which includes kale and collards, is believed by botanists to have originated during the early Middle Ages in Europe's Atlantic and Mediterranean regions. The Latin variety name acephala translates as "headless," because these plants have loose terminal clusters of foliage, not the compressed head of leaves of red cabbage, for example. Another form, commonly known as curly, Scotch, or Portuguese kale, Brassica oleracea var. sabellica, was cultivated far earlier, in ancient Greece and Rome. To further confuse matters, there is a third group commonly called tronchuda or Portuguese cabbage, classified botanically as Brassica oleracea var. costata. This third type, with its large, wide, partly overlapping leaves with broad, pale-colored midribs, reminds me of pak choi. Kale can be a productive pot herb or soup ingredient for a year or two or even three, until it simply stops producing and dwindles away. In addition to being high in vitamin C—kale saved generations of European children from the "spring disease," what we now know as scurvy—it is exceptionally rich in calcium, magnesium, potassium, and iron as well as vitamins A and B6. The leaves may be eaten boiled, steamed, or sautÃˆed, added to soups and stews, or used as a garnish. Tender young foliage may be added raw to salads. In Ireland, cooked kale is traditionally served in a down-to-earth dish called colcannon, mashed together with potatoes, sautéed leeks, and cream or milk. In Portugal, the large, flat tender leaves of the tronchuda kales are shredded and used in caldo verde, the national soup. The "heart" of the kales in this group is particularly delicate and agreeable in flavor. Kales are also handsome additions to the landscape. The shorter cultivars can be used as formal edging for flower and vegetable beds. Employ the taller forms in your perennial or annual plantings, in formal or informal designs. 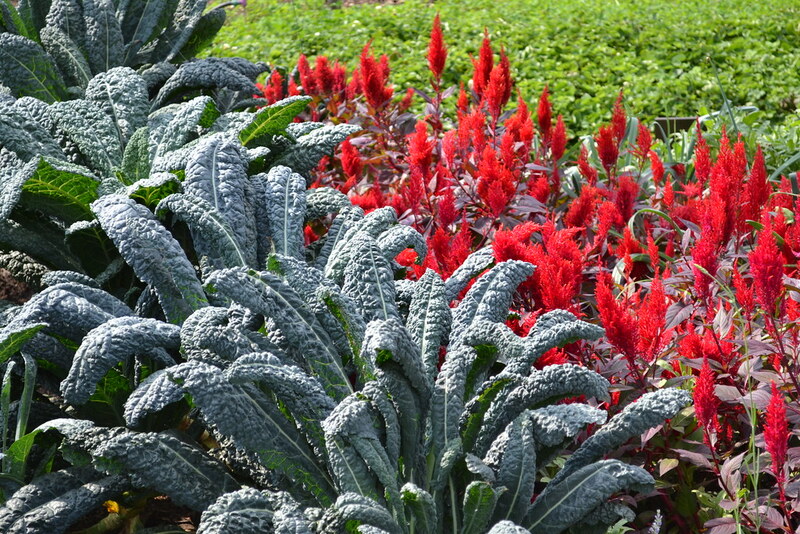 Their bold foliage can fortify your color schemes. The taller selections look sensational in containers, too. Kale leaves are even effective in flower arrangements, but remember to change the water daily to avoid rotten-cabbagy odors. Kale prefers full sun in fertile, well-drained, ideally lime-rich soil (with a pH above 6.0). It's a cool-season crop, and seed may be sown in the ground in early spring or started indoors. It can also be planted in late summer and harvested in the fall. Kale seedlings are susceptible to damping-off disease, so don't sow the seeds too thickly, and thin out the seedlings to promote air circulation. Rinsed sprouts are delicious in sandwiches and salads. When harvesting mature plants, I rarely lop off a terminal cluster of foliage but rather harvest the leaves from the bottom upward. Control insect pests such as leaf miners, cabbage butterfly caterpillars, aphids, harlequin bugs, nematodes, and flea beetles with environmentally friendly controls such as Bt (Bacillus thuringiensis) and hot pepper wax. Avoid black spot, powdery mildew, club root, and other diseases by practicing regular crop rotation. 'Dwarf Blue Curled Scotch'—a compact cultivar that yields blue-green, crinkled leaves that are tender and quite delicious, very cold hardy, and especially high in vitamin A. 'Dwarf Siberian'—a vigorous, sprawling, very cold-hardy form 12 to 15 inches tall with coarse blue-green leaves with frilled margins. 'Russian Red'—grows 25 to 3 feet tall, with lightly crinkled, oaklike leaves with unusual purple venation that have a pleasant flavor and texture. 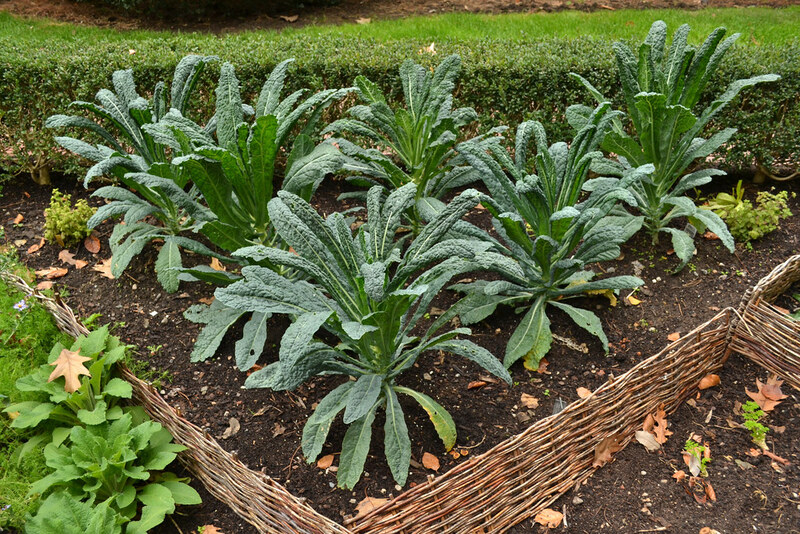 'Laciniato' (also called black cabbage, cavolo nero, nero di Toscana, and dinosaur kale)—a cultivar both highly ornamental and edible, up to 2 feet tall, with very dark green, serrated leaves 2 to 3 inches wide and 10 inches long. A major ingredient in soups and stews throughout Portugal, Spain, and central Italy, it is extremely winter hardy; freezing temperatures actually tenderize the foliage and bring out the fullest flavor. 'Red Ursa'—a notably attractive cultivar with heavily ribbed, broadly curled, very frilly foliage; excellent as a "cut and come again" green for fall and winter salads. 'De Valhascos'—a particularly tender, delicate cultivar. 'Gloria de Portugal'—bears large, wide leaves with a very tender stem and midribs. Both of these kales have great aesthetic possibilities, in either containers or planted in gardens. Palm tree cabbage—an elegant heirloom savoy form that has been known since the 19th century, bearing 2- to 25-foot-long and 3- to 4-inch-wide, recurved, darkest green or blackish leaves held in a rosette atop stems that may reach a height of 65 feet or more. Walking stick cabbage—has straight, stiff, and relatively slender stems reaching 3 to 4 feet tall in its first year and up to 12 feet after three years. The oblong leaves with undulate margins, often over 25 feet long, are sometimes picked when young, blanched, and stuffed like grape leaves. In the Channel Islands the stems are dried and made into walking sticks—hence the common name. Kale growing in wattle fencing in BBG's Shakespeare Garden. Photo by Blanca Begert. Pebbly dinosaur kale (Brassica oleracea 'Lacinata') offsets fluffy red cockscomb (Celosia argentia in BBG's Herb Garden. Photo by Elizabeth Peters. Brassica oleracea ‘Sunrise Kale’ (kale) in the Herb Garden. Photo by Alvina Lai. Brassica oleracea var. agphala cultivar (palm-tree cabbage) and Calendula officinalis (pot-marigold) at BBG's Herb Garden. Photo by Jean-Marc Grambert.